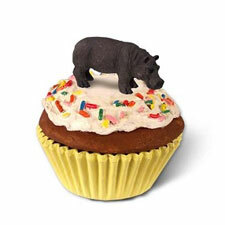 Try to picture a life sized cupcake, approximately 2� high, and 3� wide, with vanilla frosting, jimmies and the star attraction - a hippo! The top of the cupcake can be removed to reveal a trinket box base to keep your special somethings safely inside. They are hand painted and top quality. Every little jimmy is painted a different bright color. Great item for that special someone for birthdays or any holiday.